•	obliges Member States to monitor the carbon monoxide emissions of medium combustion plants. By 1 January 2023, the Commission shall assess whether for certain or all types of medium combustion plants there is a need to regulate CO emissions. •	foresees that extended compliance deadlines until 2030 may be granted to some plants, in particular to district heating systems, plants firing biomass as their main fuel, plants being part of small isolated systems (for instance, on islands), specific plants linked to a national gas transmission system. •	requires the European Commission to organise an exchange of information with Member States, the industries concerned and non-governmental organisations on the emission levels achievable with best available and emerging technologies and the related costs. Moreover, reflecting the calls of the CoR opinion to align EU source-based emission policies with air quality legislation, the directive foresees that In zones or parts of zones not complying with the air quality limit values laid down in Directive 2008/50/EC, Member States shall assess the need to apply, for individual medium combustion plants in those zones or parts of zones, stricter emission limit values than those set out in this Directive, as part of the development of air quality plans referred to in Article 23 of Directive 2008/50/EC. The ordinary legislation procedure on this proposal is still ongoing. The impact of the CoR opinion in relation to this proposal can therefore not yet finally be analysed. The European Parliament and the Council aim at a 1st reading agreement. On 28 October 2016, the European Parliament had a partial vote at 1st reading, and adopted some first amendments to the proposal. The vote on the legislative resolution has been put back to a later session. •	Maintain, and even reinforce, the provisions in Article 6, which foresee that Member States in their National Air Pollution Control Programmes have to align their emission reductions and source policy measures with reaching compliance with the air quality standards that local and regional authorities have to meet under the Ambient Air Quality Directive 2008/50/EC. Moreover, the European Parliament introduces the obligation for the European Commission to set up a European Clean Air Forum to facilitate the coordinated implementation of the Clean Air Programme, bringing together all relevant actors including the Member States’ competent authorities at all relevant levels (AM 82). deletes the proposed flexibilities allowing Member States to offset certain emission reductions achieved by internal maritime traffic (the CoR overall supported the flexibility mechanisms). The President of the EP and by the President of the Council signed on 14 December 2016 the final Directive of the European Parliament and Council on the reduction of national emissions of certain atmospheric pollutants, amending Directive 2003/35/EC and repealing Directive 2001/81/EC. The final Directive is overall of a lower ambition than the CoR and the EP in its 1st reading had called for. With the emission reductions agreed in the Directive, the health impact of air pollution is estimated to be reduced by about 50% in 2030 (compared to 2005). The European Commission initial proposal aimed at 52%. In line with the CoR Opinion, the adopted new Directive maintained the provision proposed by the European Commission in Article 6, which foresees that Member States in their National Air Pollution Control Programmes have to take account of the need to reduce air pollutant emissions for the purpose of reaching compliance with air quality objectives under the Ambient Air Quality Directive 2008/50/EC in their territories and, where appropriate, in neighbouring Member States. the new Article 12, which requests the European Commission set up a European Clean Air Forum to provide input for guidance and facilitate the coordinated implementation of Union legislation and policies related to improving air quality, bringing together all stakeholders including competent authorities of the Member States at all relevant levels, the Commission, industry, civil society, and the scientific community at regular intervals. does not include binding interim targets for 2025, only indicative emission levels for 2025 which will be identified for each member state. -	considers ambitious targets for medium combustion plants to be extremely important in achieving the targets in the national emission reduction commitments and the Ambient Air Quality Directive, but calls for a critical examination of the proposed requirements on registration and monitoring in view of their administrative costs for authorities and businesses; also suggests in view of feasibility and proportionality looking into additional differentiation options for the plants. The Environment Council adopts general approach on the proposal for the Directive on limitation of emissions from medium combustion plants.The Council also underlines the need to keep working on all the elements of the clean air package. European Commission adopts its Work Programme 2015.The proposal for the revision of the NEC Directive (COM/2013/0920) is included in Annex 2 as a modification of pending proposals.The document states: "To be modified as part of the legislative follow-up to the 2030 Energy and Climate Package"
Letter by CoR ENVE Commission Chair and CoR Rapporteur to EC President Juncker calling for retaining the EC legislative proposals. 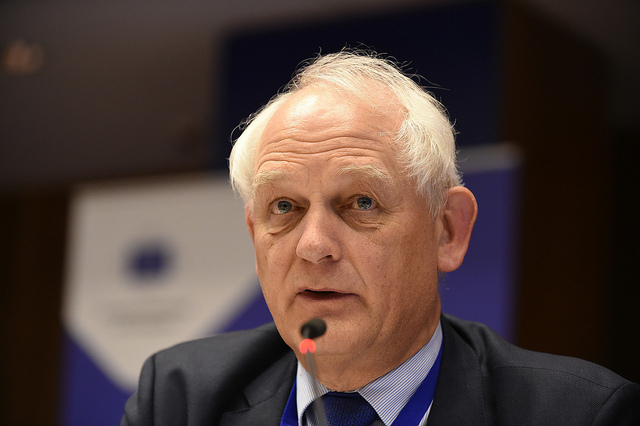 CoR President sends letter to EC President Juncker on the EC work programme 2015. The letter requests the European Commission to maintain the legislative proposals. CoR publishes a leaflet summarising the opinion. The ENVE commission adopts CoR draft opinion on "Clean Air Policy Package"
Targeted consultation aimed at understanding the different positions on the issues covered by the opinion. ENVE commission first exchange of views. ENVI Committee holds first exchange of views on the "Clean Air Programme for Europe". The discussion panel included the Head of Unit DG ENV, the EP rapporteur Julie Girling (UK/ECR) and the shadow rapporteur Elisabetta Gardini (IT/EPP).